Paris: In his maiden news conference as leader of the International Monetary Fund (IMF), Dominique Strauss-Kahn vowed on Monday to make the global lender more relevant for rising economic powers such as Brazil, Mexico, India and China. “They must have a voice and more participation," Strauss-Kahn said, adding that if not, “at the very end of the day, the very existence of the fund will be at stake". 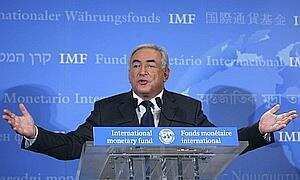 Strauss-Kahn, 58, and a former French finance minister and Socialist presidential candidate, is not scheduled to take over as managing director of IMF until 1 November. But he quickly sought to make clear his determination to restore the organization’s battered credibility. To increase the participation of new economic powers, Strauss-Kahn said that the voting structure of the 185-member nations might have to be restructured. That could lead to a reduction in the voting power for Europe as well as Russia, which backed the former Czech prime minister and central banker, Josef Tosovsky, to lead IMF. IMF, created in 1944, is struggling to redefine its role in a world that is being transformed by the economic rise of developing countries. The historic task of the fund is to bail out nations in crisis, but there has been less need for that aid in a world flush with capital. With its loans declining, IMF is under severe budget pressure and, as Strauss-Kahn put it, must develop a “new income model" to bring stability to the organization. The fund helped bail out countries after markets collapsed in Latin America, Russia and Asia in the 1990s, but with countries paying down their debt, IMF is earning less income. One alternative is to sell off some of IMF’s 103 million ounces (2.88 million kg) of gold reserves, valued at $70 billion (Rs2.78 trillion). Strauss-Kahn, who campaigned for his job on a 60,000-mile (96,000 km) voyage around the world, said the majority of finance ministers and central bankers accepted the idea of selling off the gold. “It’s possible to do, but it’s not really a solution," Strauss-Kahn said. Under Strauss-Kahn’s predecessor Rodrigo Rato, an evaluation called for a variety of measures to increase the fund’s income, including gold sales, charging fees for technical assistance and “voluntary contributions" from member nations. On Monday, Strauss-Kahn focused on belt-tightening measures “to limit the growth of expenses", saying the strategy was a question of “downsizing and focusing". Asked if the reductions could mean closing the Washington headquarters, Strauss-Kahn replied, “All of the Washington offices?" “When you want to reduce expenses you have to take everything into account, and not have general measures and say reduce everything down by 10%. We know it doesn’t work," he said. The new managing director was nominated by the French President, Nicolas Sarkozy, although the two men come from rival parties. Sarkozy met with Strauss-Kahn early in the morning before his first news conference. With Strauss-Kahn’s appointment, French officials have taken the lead in most of the world’s dominant financial posts, with the World Trade Organization led by Pascal Lamy, the European Central Bank by Jean-Claude Trichet and the European Bank for Reconstruction and Development by Jean Lemierre.